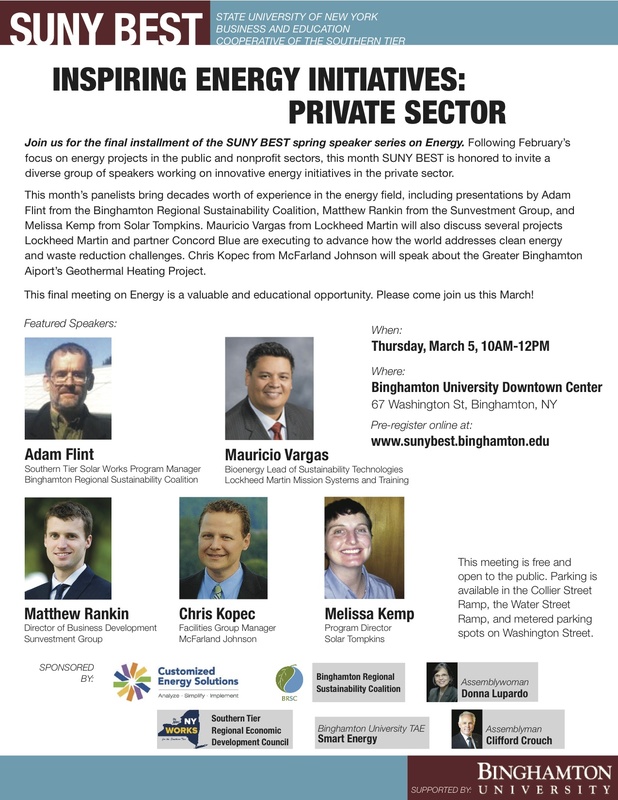 BRSC, SUNY BEST and our partners in the community are looking to leverage clean energy development to accelerate economic development progress for Greater Binghamton and the Southern Tier. This series has brought a wide array of expertise, talent, vision and experience to the local stage. (You can find videos and more information about the series at www.sunybest.binghamton.edu). Guy Hallgren, director of municipal utilities for Bath Electric Gas & Water Systems. Topic: Converting waste to energy and deploying a smart grid for the Village of Bath in the Southern Tier. Sandy DeJohn, utilities manager and campus sustainability coordinator at Binghamton University. Topic: Binghamton University’s lighting upgrade projects. Mark Howe, campus energy manager; Erin Moore, sustainability engagement manager; and Sarah Zemanick, director of campus sustainability, all at Cornell University. Topic: Cornell University’s initiatives in energy reduction, renewable energy supplies and culture change. Bernie McDermott, director of operations and transportation at Chenango Forks School District. Topic: Solar energy in the K-12 environment. Our January event, which took place at the Huron Campus in Endicott, featured Greg Hale, Senior Advisor to Chairman of Energy & Finance of the office of the Governor. His presentation focused on Renewable Heat NY -­ NYSERDA’s new advanced technology biothermal initiative; Clean Energy Financing alternatives, including New York Green Bank, NYPA municipal financing, Commercial PACE and Green Jobs Green NY; and a new focus on bringing clean energy opportunities to low-­moderate income customers. John Markowitz of the New York Power Authority (NYPA) showcased K-­Solar, a joint NYPA/NYSERDA program focused on bringing solar power to schools and surrounding communities; EE, Inc., a program that provides opportunities to pilot new technologies in State and municipal buildings, to assist with commercialization; and NYPA’s new municipal customer solutions initiative. Our inaugural session in December featured NYSERDA President John Rhodes and the New York Winter Statewide Energy Tour, an interactive, informational session designed to increase awareness of New York State’s clean energy policies and community aggregation initiatives including NY Prize. NY Prize is a first-in-the-nation $40 million competition to enlist communities to advance plans for local power infrastructure in the form of micro-grids, designed to promote clean energy, reliability, resiliency, and affordability. It is part of New York’s comprehensive effort to build a cleaner, more resilient, and affordable infrastructure. These coordinated and complementary activities include Reform Energy Vision (REV), NY Green Bank, the Clean Energy Fund (CEF) and The NY-Sun Initiative. This trailblazing approach is designed to rapidly integrate clean energy — promoting more efficient use of energy, deeper penetration of renewable energy resources such as wind and solar, and wider deployment of “distributed” energy resources, such as microgrids, on-site power supplies, and storage. It will highlight potential partnership and investment opportunities for regional businesses and discuss ways communities can reduce energy costs, promote clean energy and help build a more resilient, reliable, and affordable energy infrastructure. This presentation highlighted potential partnership and investment opportunities for regional businesses and discuss ways communities can reduce energy costs, promote clean energy and help build a more resilient, reliable, and affordable energy infrastructure.